When managers and marketers outline their social media strategies, they often plan for the "right hook"-their next highly anticipated sale or campaign that's going to put the competition out for the count. Even companies committed to jabbing-patiently engaging with customers to build the relationships so crucial to successful social media campaigns-still yearn to land the powerful, bruising swing that will knock out their opponent or their customer's resistance in one tooth-spritzing, killer blow. Right hooks, after all, convert traffic to sales. They easily show results and ROI. Except when they don't. To ask other readers questions about Jab, Jab, Jab, Right Hook, please sign up. anyone has read this book and apply it? what was the results? I had a chance to catch some Marietv.com and she was interviewing Gary about his new book. I'll be honest, he was new to me and I almost turned the video off because I just don't have much time to read books right now unless they will help me write mine, or can help me with developing my healing-base business. Holy crapola, I'm so glad I didn't turn off the video. In fact, I watched it and then downloaded the book to my Nook. This was the first book in a long time I simply couldn't put down, and I had a chance to catch some Marietv.com and she was interviewing Gary about his new book. I'll be honest, he was new to me and I almost turned the video off because I just don't have much time to read books right now unless they will help me write mine, or can help me with developing my healing-base business. Holy crapola, I'm so glad I didn't turn off the video. In fact, I watched it and then downloaded the book to my Nook. This was the first book in a long time I simply couldn't put down, and read all the way to the end. I was both educated and entertained at the same time. I love that when I read it, I felt like the author was sitting in the room telling me all this stuff rather than just reading it in a book. There were lots of LOL moments when my husband kept asking what I was reading. Gary's no-nonsense descriptions of the various social media sites and how to use them is INDISPENSABLE! Not only did I garner information to use for my business, but also for a non-profit that I work with. The examples given with the good, the bad and the ugly as to why posts worked and didn't work....just mind-boggling. As you look at the example and read his description you sit there saying to the book "of course!" I finished the book today and already plan to go back to re-read it regularly as I develop my social media presence. If you have a business and utilize social media or are planning to - this book is a MUST for your library. I'm definitely a new fan and if you aren't - you need to be. This is one of those books when you say "holy crap, this guy is brilliant!"...seriously. Great book!! If you are an inexperienced social media/ digital marketer, you will find this book useful. While Gary does make some very good (and obvious) points, anyone that has experience in the space will find them elementary. The author seems to have a good understanding of how the diff social media platforms have a certain "vibe," and I'm sure his suggestions will be effective. He also has a lot of examples of good and bad business posts to the platforms. However, I got lost with the boxing analogies!! If you are an inexperienced social media/ digital marketer, you will find this book useful. While Gary does make some very good (and obvious) points, anyone that has experience in the space will find them elementary. The author seems to have a good understanding of how the diff social media platforms have a certain "vibe," and I'm sure his suggestions will be effective. He also has a lot of examples of good and bad business posts to the platforms. However, I got lost with the boxing analogies!! This book certainly had some valid and thought provoking points - To sell your product on the Internet is more than a website, one has to be able to navigate the different social media platforms and if you are selling something (even if it is yourself as a personality), you have to stand out and that's what the author sets out to do and to a large degree, the author covers as much as possible (Facebook, Twitter, Tumblr, etc)...but it would have been nice to have seen a few examples that weren't BIG/well known companies. I will give it a pass. I'd recommend The Zen of Social Media Marketing by Shama Kabani. Ah..and the author's constant reminder of his other books and how good they were and go read it - was annoying. Worried about good content and bad writing? Not the case. Minimalist, straight to the point writing, amazing content. This book is brilliant. I have to say, this time, Gary found a sweet spot - he got it right. The main problem with the first two books were the writing - even though the content Gary brings up is great, you can tell that by following his videos around - the writing was not okay, a little repetitive and tiring. In this book, no, my friend. The writing is light, straight to the point, Worried about good content and bad writing? Not the case. Minimalist, straight to the point writing, amazing content. In this book, no, my friend. The writing is light, straight to the point, being even enjoyable. And the concepts he brings are brilliants and results-oriented. He takes the reader by hand and show how to do it right in social media. I liked the premise about getting your story out there in a noisy world. However, the book read as an extension of the author's brand more than discussing good content online. OK so I loved this book! I haven't read a lot of books on social media so I thought this would be a great one for my book club "Business-Related Books For Success"! Gary Vaynechuk really stresses the importance of micro-content on social media! What is so cool about this book is that he fills the pages with sample posts that are excellent as well as lame as hell! His reviews on company's social media posts are hilarious! He lost me at "See you later, Alligator"! So funny Gary! Great Quote from J OK so I loved this book! I haven't read a lot of books on social media so I thought this would be a great one for my book club "Business-Related Books For Success"! Gary Vaynechuk really stresses the importance of micro-content on social media! What is so cool about this book is that he fills the pages with sample posts that are excellent as well as lame as hell! His reviews on company's social media posts are hilarious! He lost me at "See you later, Alligator"! So funny Gary! Great Quote from Jab, Jab, Jab, Right Hook: "Every year, the world becomes a little smaller, a little more social, a little more connected. Creating content that allows us to share our experiences, thoughts, and ideas in real time is becoming an intrinsic part of life in the twenty-first century (in fact, it's getting to the point that were making a statement when we don't share or choose not to connect)." I love Gary Vee, but I hadn't planned on reading this book. "Thank You Economy" was a little meh for me after "Crush It" so it took me seeing him in interviews with Marie Forleo and Chase Jarvis to realize I needed to read JJJRH. They were so complimentary of the content that I felt compelled to buy and read it. Glad I did. Like I said in my review for Simon Sinek's book "Start With Why", as a newbie, I need you to show me how to get from A to B to C before I'll be able to see the path from A to I love Gary Vee, but I hadn't planned on reading this book. "Thank You Economy" was a little meh for me after "Crush It" so it took me seeing him in interviews with Marie Forleo and Chase Jarvis to realize I needed to read JJJRH. They were so complimentary of the content that I felt compelled to buy and read it. Glad I did. Be interesting. Be useful. Be inspiring. Be visual. Be generous. Some of the wisdom of Gary V which he shares by analyzing the social media posts of various brands. Particularly good on visual marketing. Better in print as very visual. This is an excellent book about marketing right on social media. The author does a fantastic job of explaining what works and what doesn't with actual examples of social media jabs and right hooks. We have gleaned so much information from this book about marketing our business and personal accounts. I highly recommend this to anyone who wants to make a statement on social media with their business. It is getting increasingly hard for companies, big and small, to tell their story in this noisy, chaotic, social media world. This book attempts to make that task a little easier. Most companies are on social media because it is "expected," or because their competitors are already here. But they have little, or no, idea as to how to do it the right way. Perhaps the biggest rule is to Create Interesting Content. Give people a reason to visit you on Facebook or Twitter more than once. Post somethin It is getting increasingly hard for companies, big and small, to tell their story in this noisy, chaotic, social media world. This book attempts to make that task a little easier. Most companies are on social media because it is "expected," or because their competitors are already here. But they have little, or no, idea as to how to do it the right way. Perhaps the biggest rule is to Create Interesting Content. Give people a reason to visit you on Facebook or Twitter more than once. Post something funny, or something that makes the reader think. Later, you can ask for their money ("Buy Our Stuff"). It should be obvious that the link included with the request for your customer's money should go right to your website's ordering page, not the main page. Make it as easy as possible for people to buy your stuff. What works on Facebook will not work on Twitter or Instagram, nor should it. You need to get creative and tailor your posts to each site. The author spends much of the book looking at actual marketing campaigns, from big and small companies, on various social media sites. He explains exactly how Company A got it right, Company B got it half-right, and Company C really shouldn't have bothered. The days of a company choosing a motto or a face of the company, and using it everywhere for several months, are also gone. Don't be afraid to change your marketing often, even every day. If your Twitter or Pinterest approach is not working (there are ways to gather, and analyze, such information), dump it, now. It is not going to suddenly get better. Gary's latest book does a great job of presenting how to make social media updates interesting. His advice on community management, while martial in tone, is right in the sense that you need to nurture before you ask. Gary is one of the best marketers in the business, so his Ogilvy-esque take on updates is very interesting. More experienced social media marketers may find this to be pedestrian, but it never hurts to polish up. There are some issues from a B2B marketing perspective. Gary classifie Gary's latest book does a great job of presenting how to make social media updates interesting. His advice on community management, while martial in tone, is right in the sense that you need to nurture before you ask. Gary is one of the best marketers in the business, so his Ogilvy-esque take on updates is very interesting. More experienced social media marketers may find this to be pedestrian, but it never hurts to polish up. There are some issues from a B2B marketing perspective. Gary classifies LinkedIn and Google+ as emerging networks, and questions the strength of Google+. Any B2B company not on LinkedIn right now needs to get on board ASAP. This is the professionals social network. There are plenty of people on G+, and it is a critical network for content creators to get their information indexed by Google. For the sake of my job sebagai Head of Social di salah satu perusahaan copy writing di Surabaya, selain karena buku ini memiliki judul dan penampilan yang unik, ternyata banyak ilmu yang bisa didapat dan berguna untuk para admin di luar sana. Kalau kamu tertarik dengan dunia pemasaran digital terutama yang berhubungan dengan media sosial, buku ini sangat cocok untukmu. Dengan bahasa yang tidak berbelit-belit dan disertai contoh studi kasus nyata, aku rasa pembaca menjadi semakin peka dengan segala macam media sosial yang melakukan pemasaran. Siapa tahu malah bisa mengkritik seperti apa yang dilakukan oleh Vaynerchuk di dalam buku ini. This pretty much sums it up: "Content is king, context is God and then, there if effort". big ones in great detail) and you will see results sooner than later. He shows you examples of good and not so great posts, analyzes them and provides enough detail that anyone could benef This pretty much sums it up: "Content is king, context is God and then, there if effort". This is a good book to start with when trying to advertise on big social media platforms. While it doesn't provide guidance as to how to advertise on these sites, it provides principles that marketers and business owners have to take note when doing social media advertisements. In a very brief summary, the book mainly went through 5 big social media platforms: Facebook, Twitter, Pinterest, Instagram, and Tumblr. The marketing perspective taught by this book is that consistent microcontent (which This is a good book to start with when trying to advertise on big social media platforms. While it doesn't provide guidance as to how to advertise on these sites, it provides principles that marketers and business owners have to take note when doing social media advertisements. In a very brief summary, the book mainly went through 5 big social media platforms: Facebook, Twitter, Pinterest, Instagram, and Tumblr. The marketing perspective taught by this book is that consistent microcontent (which the author calls them as "jabs") that does not encompass any sales purposes (e.g. advertise for the sake of making sales) helps tremendously in establishing a good relationship with the users of the platform. This will increase the effectiveness of a business's call-to-action advertisement (which the author calls them as "right hooks") in the future. The skills and concepts in this book are marketable and transferable. Start a club in which teens (under adult supervision) create social media posts to help promote your branch/organization/teen club – fundraisers, call for volunteers, recruit participants. This is a concrete, project-based application of technology. Kids can add the experience to their resumes and college applications and the NGO can use it to apply for grants. It’s win-win and free. Good luck holding those kids back! Gary Vaynerchuk is fun, knowledgeable, and challenging - exactly how he wants you to design each social media post. Remember to include your logo on the pictures. Vaynerchuk wants you to get people to LIKE your brand BEFORE asking them to buy your brand utilizing the unique characteristics of Facebook, Tumblr, Instagram, Pinterest, and Twitter. Each chapter focuses on specific social media features, how people use it, what makes an effective and memorable post, and how to make a lousy one. Examples from multinational companies and celebrities: Victoria’s Secret, Mercedes, Jeep, Selena Gomez, and Katy Perry. Social media is the new, almost free advertising (employees gotta get paid but no million dollar ad placements). Entrepreneurs and small businesses can apply these principles. Quality photography is the one expensive but essential part. Mastering one medium at a time would be less intimidating than trying to do all well at once. Immediate cons: was published in 2013 and is talking about a social media landscape that changes every 6 months. It's already, in parts, dated. The message here is the same in almost all Gary Vee content: be authentic, be true to your brand, cultivate customers and followers using long-term strategy and time-intensive, non-scaleable tactics. Additionally, here he reminds you to respect the platform. Don't post something on twitter that obviously should be on Pinterest. The medium is the message. It's lazy to cross-post the same thing across every platform. The leaders in social media never do that. A little dated reading in 2019 (Vine and Google+ have gone the way of the Dodo) but a lot of the principles remain solid and direct. Been putting a few of these practices to work since starting the book and it certainly makes a difference and has been aiding my podcast. All in all, well worth the read. I enjoyed the MBA style case study format. In my opinion, practical example of successes and failures are the best way to learn. In general, nothing is groundbreaking for a frequent user of those platforms. However, it reinforces concepts and techniques (e.g., quality photos, short and straightforward text and audience-oriented content) that many use. Must read for those who work in (or alongside) social media, especially those starting out. Mind you, if you've been working in social media for a while and you're not already across these concepts in your day to day work, you've got some catching up to do. Loved this book, very pragmatic and what I've been trying to tell people for years!! Goed boek over social media en hoe je het moet gebruiken! Altijd goed om extra dingen te leren. Ook tof dat hij echt social media posts bespreekt en aangeeft wat er wel en niet goed aan is. Zeker de moeite waard als je nog niet zoveel van social media weet! Popularny vloger radzi jak planować posty na różnych platformach. Mnie zaciekawił głównie facebook i instagram, choć Gary pisze także o innych mediach społecznościowych. Nie przemówiła do mnie metafora ringu i walki bokserskiej, co sprawiło że cała książka dla mnie była dość trudna w odbiorze. Alles wat je al weet over social media, mooi samengevat en gepresenteerd op een blaadje dat u zin doet krijgen om er mee aan de slag te gaan. En ondanks dat er niets echt nieuw in dit boek stond heb ik toch het gevoel dat ik veel heb bijgeleerd. Quite a good read. Lots of good information, even if it is a tad old in the fast paced world of social media and online marketing. Recommend having a read if you're looking for some guidance and need a spark to get you moving. It often happens that readers downgrade a book saying that the same could have been written using only half the words but I think it's the first time I'm annoyed at a book because it promised more substance based on its dimensions but with a more standard typesetting would have only been half as long. Gary Vaynerchuk mentions at one point that he was looking to give the book also a visual social media feel but I don't buy it - my sentiments when reading it were more along the lines of - let's se It often happens that readers downgrade a book saying that the same could have been written using only half the words but I think it's the first time I'm annoyed at a book because it promised more substance based on its dimensions but with a more standard typesetting would have only been half as long. 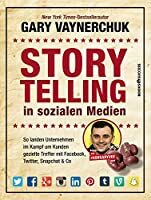 Gary Vaynerchuk mentions at one point that he was looking to give the book also a visual social media feel but I don't buy it - my sentiments when reading it were more along the lines of - let's see how many bells and whistles can we add to make this look like a big professional bible of social media so we can charge more for perceived added value. I read this in one day, and would highly recommend anyone interested in social media to browse through it as well. It is mostly pictures (examples) of posts, tweets, pics that are either really cool, or epically awful. Then, the author explains in detail why. He briefly breaks down the major points of the most popular social media platforms (Facebook, Twitter, Instagram, Pinterest, Tumbler, LinkedIn, Snapchat and a couple others) and some of the major differences in style, attitude, and follower I read this in one day, and would highly recommend anyone interested in social media to browse through it as well. It is mostly pictures (examples) of posts, tweets, pics that are either really cool, or epically awful. Then, the author explains in detail why. He briefly breaks down the major points of the most popular social media platforms (Facebook, Twitter, Instagram, Pinterest, Tumbler, LinkedIn, Snapchat and a couple others) and some of the major differences in style, attitude, and followers of those platforms. And then, of course, how to use those to a business advantage. While I definitely recommend this book (really, for people interested in their "reach" on social media), I wouldn't recommend purchasing it. Go check it out at the library. It will only take you a couple of days to flip through it, take notes on the major points you need to remember, and then know that all of it will be outdated next year. Which brings me to my last observation: kuddos to anyone to can write books on current topics that change as quickly as our interest in new technology and platforms. I love Vaynerchuk's attitude and writing style. He doesn't mess around. He's informative and practical. There is no fluff in his books. Yet, he's confident and funny. I was lucky enough to win tickets to the launch event for this, Vaynerchuk's third foray in to authorship as an authority on social media. As well as including a Q & A with the author himself, attendees were also given a free copy of this book, and I love free books. Here, we have something a little different to Vaynerchuk's previous work - in JJJRH, he scrutinises the micro-content pushed out by dozens of major brands. Sometimes, it works - Oreo's Superbowl tweet is a good example of this. O I was lucky enough to win tickets to the launch event for this, Vaynerchuk's third foray in to authorship as an authority on social media. As well as including a Q & A with the author himself, attendees were also given a free copy of this book, and I love free books. Here, we have something a little different to Vaynerchuk's previous work - in JJJRH, he scrutinises the micro-content pushed out by dozens of major brands. Sometimes, it works - Oreo's Superbowl tweet is a good example of this. Other times, it doesn't - you just have to look at the sad state of some of the content pushed out by half-arsed marketing managers who refuse to dedicate serious time and effort to social media. Telling my story in the social world is critical to my job. I am a pastor of a young church. We are a mobile church (we don't have our own building), so in some ways we have a more permanent place online than other places. I have read a number of other social media books geared to faith-based institutions but they have all fallen really flat. Vaynerchuck's book is AWESOME! This is the most helpful text I have read by far. We have a compelling story to share and he helps you frame it for the part Telling my story in the social world is critical to my job. I am a pastor of a young church. We are a mobile church (we don't have our own building), so in some ways we have a more permanent place online than other places. I have read a number of other social media books geared to faith-based institutions but they have all fallen really flat. Vaynerchuck's book is AWESOME! This is the most helpful text I have read by far. We have a compelling story to share and he helps you frame it for the particular social media networks to make impressions, engage your community and make an impact. It also have some really wonderful case studies as examples. 2. Using images in Twitter much more. 4. Think how to use snapchat in business. Love "Crush It," by Gary Vaynerchuk, we've listened to this audiobook roughly 15 times in the studio ... This book ... Well, it's tough to write a book on social media and stay current ... Jab, Jab, Jab, Right Hook is 2 years old, and it shows. If you're clueless about social media, and media strategy for brands, sure, there are some useful tidbits. As someone very familiar with social media and branding, I found it mostly common sense and stuff I already knew. 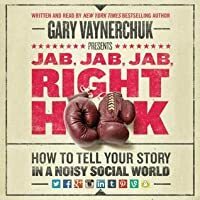 Maybe if Gary V was reading it, I'd Love "Crush It," by Gary Vaynerchuk, we've listened to this audiobook roughly 15 times in the studio ... 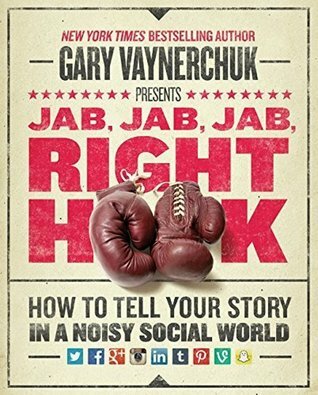 This book ... Well, it's tough to write a book on social media and stay current ... Jab, Jab, Jab, Right Hook is 2 years old, and it shows. Maybe if Gary V was reading it, I'd have liked it more (no audiobook yet). "Being cool has nothing to do with age; it has to do with how solid your identity is." Gary Vaynerchuk is the ultimate businessman. Born with an entrepreneurial spirit, Gary is a proven investor and advisor in the world of startups, and now an expert on the Fortune 500 world, through is work as CEO of Vaynermedia, a social media marketing agency. Having two bestsellers under his belt doesn't hurt either. Thirty-three years ago, Gary got his start in business by ripping flowers out of Gary Vaynerchuk is the ultimate businessman. Born with an entrepreneurial spirit, Gary is a proven investor and advisor in the world of startups, and now an expert on the Fortune 500 world, through is work as CEO of Vaynermedia, a social media marketing agency. Having two bestsellers under his belt doesn't hurt either.